For the better part of 2017, the marketing team at SEOteric has been talking about SEO, site engagement, bounce rates, and click-through rates as it relates to ranking factors. We have been seeing stronger correlations between good user metrics and rankings. We half jokingly said this must be tied to Google’s Rankbrain engine (the artificial intelligence learning engine). Google famously admitted that they weren’t sure exactly what Rankbrain was doing. The also said that the 3 main ranking factors are content, links, and Rankbrain. If Rankbrain was learning how to best match searcher intent with results (as it was supposed to), then it is reasonable to assume that it is learning how users interact with sites, and rewarding sites with good engagement and higher chances of search accomplishment. Whether this is evidence of Rankbrain or not, we are certainly seeing the impact of engagement on rankings. In all fairness, this post may fall into the TL:DR or TT:DR (Too Long : Didn’t Read or Too Technical : Didn’t Read) arena, but for those interested in SEO and Google, you should get something out of it. You guys keep reading. Moz published a WhiteBoard Friday video about a potentially new ranking signal called “search accomplishment” which is exactly what we had been attempting to define. Search Accomplishment is where a user gets what they needed and intended to from a search. That could be finding a doctor, ordering a replacement part, finding local restaurants, getting store hours, or searching for real estate. As users interact with a website from search results, Google (and potentially Rankbrain) is able to see a site’s engagement metrics like click-through rate, bounce rate, and other factors, and if it sees a pattern develop, it should be able to react accordingly. Click-through Rate is the percentage of people that see your website VS the number of people that actually click on it. Better click-through rates tend to mean a better match of titles and meta data to the search query. Higher click-through rates indicate that users think your website may be the best solution or answer to their query. This is why titles and meta data are important not just from a rankings perspective, but also from a user experience perspective. Bounce Rate is defined as when a users visits a site, looks at one page, and leaves within a short amount of time. We’ve looked at bounce rate from 3 different perspectives based on this analytics definition. First is the Google Bounce, where a user clicks on your site, stays a short period of time, and returns back to Google to continue their search. We see this as being the worst kind of bounce, as it essentially says “this site didn’t meet my needs, so I need to continue my search”. As Google sees a pattern develop around Google Bounces, it can potentially learn that a site is (or isn’t) a good match for a search, and adjust its ranking accordingly. Second, we see a Non-converted Bounce. This is where a user clicks on a website in the search results, looks at one page for a short period of time, and then leaves by closing the browser window. This ends the search session and counts as a bounce on the website. Third, we see a Converted Bounce. This is where a user clicks on a website in the search results, looks at one page for a short period of time, and then leaves by closing the browser window – but “converts” by getting the information they need. This ends the search session and counts as a bounce on the website, but may result in a positive user experience. We’ve seen this where users quickly get a phone number, place a phone call, get an address, or get other answers from a landing page that resulted in a short single page visit. The opposite of a bounce is an engagement, where a user interacts with your site’s content, looks at multiple pages, and is there for a longer period of time. From Google’s perspective, both a Converted Bounce and a Non-converted Bounce may look the same from an analytics perspective. Short visits and single page visits may not be as likely as engaged visits to have achieved search accomplishment, so Google has to define what search accomplishment is. So the idea of “search accomplishment” could simply be defined as getting an answer that satisfies the search enough to end it. It could potentially also only include an engaged visit that resulted in a new search or ending a search. That’s the part that is difficult to define for sure. Regardless of HOW Google defines it, we know WHY they want to define it, so we can create actionable steps towards meeting an objective that helps users accomplish their search tasks. SEO is about getting better rankings in Google to increase exposure and revenue. We want the additional exposure to produce transactions like leads or purchases. If we understand what search accomplishment is, and how a user gets to that accomplishment, then we can use our websites to create a path to that accomplishment. What we need to do as marketers is to find the balance needed between getting the website conversion (actually getting a lead) and search accomplishment (meeting the searchers need). Sometimes that means giving information that may not lead to a “transaction” like a purchase or a form submission in an effort to earn trust or improve relevance. The better job our website does at being a resource that meets the needs of searchers, the better our site will perform in search engines, and the better chance we have at earning conversions. The video points out the conflict between conversion rate optimization and SEO. Conversion Rate Optimization tends to want to remove “clutter” or unnecessary content, improve focus, and get right to the point of conversion. SEO says to provide more content and answer more questions so we are seen as a better resource. The challenge we face is balancing both in a way that adds value. We look for ways to provide in-depth content and information by incorporating frequently asked questions, providing supplemental content that is related to the main topic, and creating a design and UX layout that makes more content easily consumed. We want to make it as easy as possible to get all the information a user needs, and then have them take some desired action. 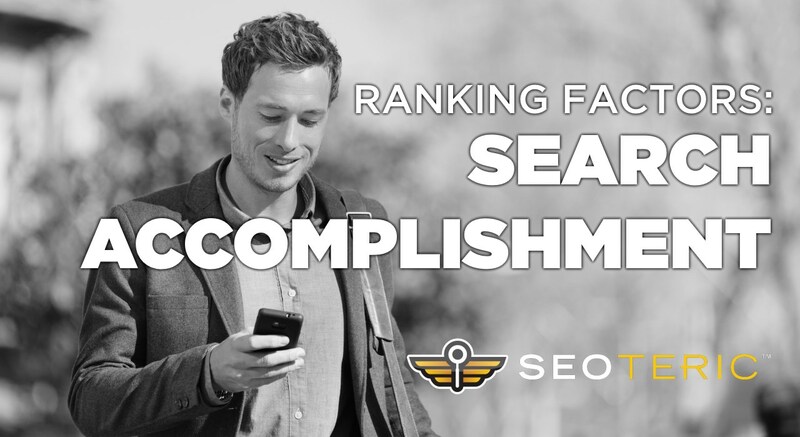 In the end, SEO has always in some way been about search accomplishment. How you get there, and what Google is able to measure is what has changed over the years. The basics of being a relevant and credible source hasn’t changed, but Google is getting better and more sophisticated at understanding behaviors and patters, cutting out spam, and rewarding websites that meet users needs. If we keep a focus on the user (and accomplishing the task of the searcher), then we position ourselves as a long-term winner in SEO.